Region-blocked content is annoying — and avoidable. Whether you want to view non-Australian versions of Netflix, instant access to the BBC iPlayer or a dose of iView when you're working overseas, here are the best (and easiest) ways to get that content. One of the main challenges with streaming content from overseas is that the landscape for doing so constantly changes. Historically you've needed to set up a virtual private network (VPN) to access content from overseas, but these days sometimes all you need is to choose the right extension or web service. First, we'll look at our favourite (and simplest) way of getting to region-blocked content, then check out some of the alternative possibilities. Note: We no longer recommend Hola Better Internet, after the discovery that it sell your bandwidth to essentially run a botnet for hire. As we learned from Hola Better Internet, you're much better off paying for a VPN service than trying to find a free one. To that end, we like TunnelBear because it's cheap, supports a variety of devices, and is incredibly easy to set up. 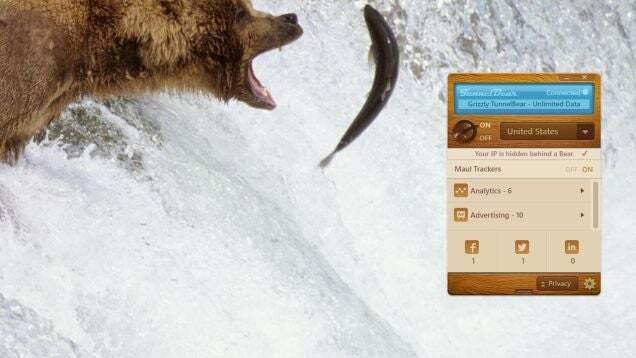 On the desktop, TunnelBear has apps for PC, Mac, and a Chrome extension that you can route your traffic through. Once you've signed up for an account and install the app, switching between countries to access the internet from is dead simple. Just launch the app, select the country you want to access the internet from, and TunnelBear does the rest. In terms of pricing, TunnelBear is in line with other options out there. Each month, you get 500MB of free data. If you need more, TunnelBear offers unlimited data for $US4.99/month (or if you prefer to save a little by paying in bulk, $US49.99/year) on three computers or mobile devices. It does more than just change your country, offering other VPN services such as blocking traffic and allowing truly private browsing. Steaming blocked content to your Android and iOS devices is a little trickier, but it's still doable. Once you sign up for TunnelBear and install the app on your mobile device, just tap the "Country" button on the main page, and change it to where you'd like to access the internet from. TunnelBear installs a custom profile, and all your internet traffic goes through servers in those countries. On mobile, that means you can access these servers through their web sites or through their apps. The whole process takes about 20 seconds to get working and it's easy to turn off when you don't need it. If you only plan on using TunnelBear on mobile, there's a cheaper mobile-only pricing plan ($US2.99/month) that you can purchase from the app itself. Unblock-Us is a solid choice for set-top devices, because it's cheap, easy to set up, and works on numerous devices. The setup process is a little different for each device, but the service offers detailed guides for a wide range of options. Unblock-Us has a massive list of supported services and constantly updates with guides to unblock current programs. Unblock-Us costs $US4.99/month, but there's a free 7-day trial to see if it suits you. You have a lot of options in this space, but Unblock-Us gets our vote because of the number of devices it supports and its solid customer service. If you're looking to watch videos or listen to music from other services, here are a few more useful options. Proxmate: If your main aim is to unblock US services, the previously mentioned ProxMate is another option. After you install the extension, you'll get free access to Pandora, Google Play, YouTube and others no matter where you are, but you'll need to pay for premium access to sites like Netflix and BBC. You'll need to manually install the extension in Chrome, but once it's installed you're good to go. Use Any VPN You Want: Another option is to set up a VPN to reroute your traffic through servers in other counties. Any VPN will do (although you might want to stick with one of these five). If you subscribe to a Usenet service like GigaNews, you might even get a VPN for free as part of the package. This keeps your data a lot more private than the above services, but it will potentially slow down your connection. Hotspot Shield: Hotspot Shield works just like TunnelBear, but isn't quite as simple to use. If you're not a fan of TunnelBear for whatever reason, Hotspot Shield is a great alternative. Set up a proxy server: If a browser extension is more your style then using a proxy service is easy enough. The speeds won't be that great, but it's easy to shut off when you're done. You can also try the Tor browser for a few more options. Media Hint: Media Hint is an extension for Chrome and Firefox that automatically unblocks content from Hulu, Netflix, Pandora and Rdio. Unfortunately, it's no longer available directly in the Chrome Store, so you'll have to manually install it. Currently using Getflix. It's cheaper than Unblock-US and growing with VPN added recently in addition to DNS. One note however - the tech support on Unblock-US is consistently better. So when Netflix magically stops working because they've locked in Google for their DNS - you'll need to search around for solutions yourself. Yes, Getflix tech support isn't the best, but it needs to be acknowledged that none of these services are ready for the neophyte consumer market. They all require a reasonable understanding of what is happening and how to manage it. No mention of the free DNS provider tvunblock.com ? It's a free DNS alternative that works really well for the average user. The only thing is that you have to open the website up once a month to whitelist your IP address, but that is hardly an issue and they offer means that you can write your script to automatically ping the IP reactivate it so you don't have to (they have an API to do so). TL;DR, use tvunblock.com as it is free and works well. why would anyone use a vpn to stream content when you can use something like globalTV smarterDNS access such as the one i use from foxvpn. means you get your full bandwidth speeds. Because some canny operators will go out of their way to determine if you are actually in the country of origin, such as Hulu. Because you may already have a VPN for other activities, ahem. Another really good option for finding where to watch any show or movie is the YO.TV app. It's awesome, works on both iOS and Android. It's like a really good google for finding where to watch the stuff you want. Works in like 60 countries. Real TV as well as all the on demand VOD stuff. As far as I'm concerned you can access any geoblocked content from the UK or US using these steps https://www.unblocknetflix.co.uk/us-vs-uk-netflix-how-to-switch-netflix-country-with-dns-or-vpn-proxies/ Works like a charm for me. I like VPN Unlimited. I've used for over a year and really like the service. I've recently moved to Kazakhstan from Australia and would like to know if anyone has experience or advice on accessing Aussie TV. I had a Netflix account there too, is it possible to access it through a VPN? I've got myself a VPN, how do you get around the whole Hulu billing issue? It won't even accept my prepaid debit card from the USA, even though I lived there for 13 years and used the card to pay for practically everything while I was there.. Interested to hear how you got around this? vpn will no support any queries about streaming as this is up to the content provider and not the vpn. Got my money back will look into pixelpaul's advice.